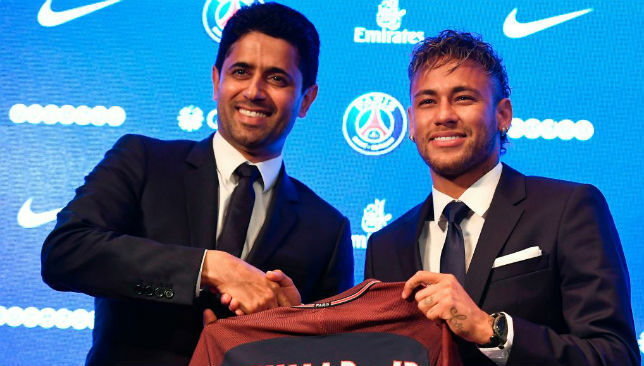 Real Madrid have come under criticism from Paris Saint-Germain president Nasser Al-Khelaifi for their pursuit of Neymar. Los Blancos have made no effort to hide their interest in the Brazilian and the PSG chief has now taken a jibe at the Spanish giants for their ‘behind the scenes’ moves to secure his signature. “To be a realist it’s a bit frustrating, because it isn’t fair that other clubs or someone talks to our players,” he told Marca at the launch of the Ligue 1 champions’ partnership with Michael Jordan’s Nike brand. “We don’t like it at all and we’ve talked about it at the time with Real Madrid. We have a good relationship and they say they respect PSG, I hope that is true. Madrid have been desperate to replace Cristiano Ronaldo, who left for Juventus over the summer, and Neymar has topped their list of potential heirs to the Portuguese’s throne at the Santiago Bernabeu. “If there is something, it is better that we talk, talk with Florentino Perez or with whoever and we say what we like and what we don’t like,” Al-Khelaifi added. 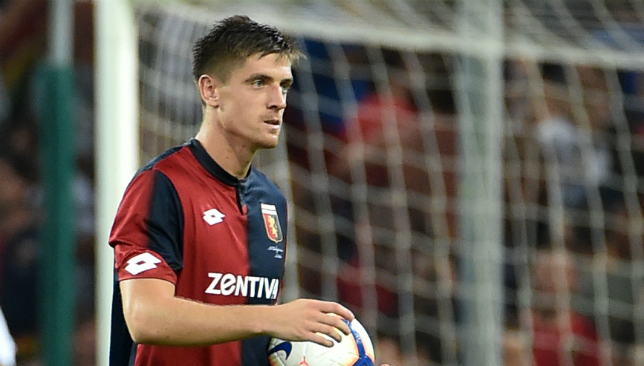 Polish striker Krzysztof Piatek is turning heads across Europe after a stunning start to life in Serie A. While Cristiano Ronaldo is struggling to get off the mark in Italy for Juventus, Piatek took just six minutes to register his first league goal for Genoa. In total, he’s scored seven times in his first three outings for Genoa, including a stunning four-goal debut in the the Coppa Italia. His form earned him a first call-up to the national team for Poland’s most recent international engagements, and the 23-year-old is drawing comparisons to a much more famous compatriot after bursting onto the scene in Italy, being dubbed the “new Robert Lewandowski”. And Genoa have already had to issue hands-off warnings to other clubs, with club president Enrico Preziosi telling Napoli they had no chance of landing the youngster, who arrived in Italy this summer for a paltry €4.5million from Cracovia in the Polish league, any time soon. Meanwhile, Barcelona have also been linked with a move for Piatek, having begun keeping tabs on the player after his fast start to life in the Italian league. The striker is apparently being weighed up at the Camp Nou as a long-term replacement for Luis Suarez, who at 31 has started to show signs of slowing down over the past year. Ajax have set a €75million transfer price for coveted midfielder Frenkie de Jong, a long-term target of Barcelona, according to Sport. La Blaugrana failed with an approach for the Dutchman this summer, seeing a bid of €30million knocked back. Ajax sporting director Marc Overmars subsequently stated that no players would be sold this year given the club’s Champions League commitments and the belief that the young stars at the club would benefit from another year of being developed at home. Barcelona have now reportedly set their sights on next summer as the time to land the 21-year-old, who has also been linked with moves to Real Madrid and Tottenham. The Premier League club also made a bid for De Jong this summer, believed to be €50million. 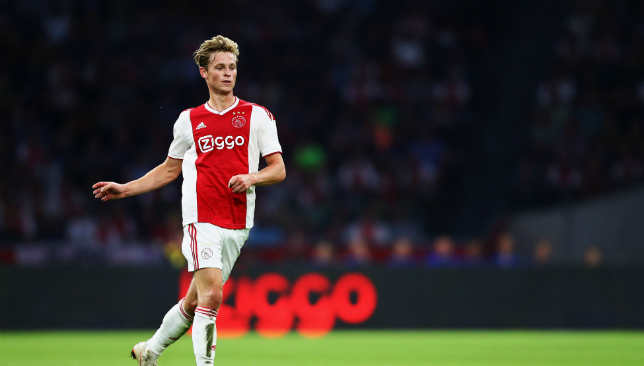 The La Liga champions are convinced that De Jong is a player who can be a future star at the Nou Camp, with the board unanimous in its belief that the Netherlands international is a perfect fit for Barcelona. “Barca can allow other errors but not letting De Jong escape,” former sporting director Roberto Fernandez said. Ex-Barcelona player Ronald Koeman gave De Jong his international debut recently, and was also quick to praise the youngster. “He’s a debutant who plays like a veteran, with a lot of quality, he’s a great talent,” Koeman said.